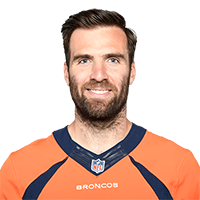 Published: Sept. 13, 2015 at 07:29 p.m.
Ravens quarterback Joe Flacco makes a pass intended for Crockett Gillmore, but it is intercepted by Broncos safety Darian Stewart. Published: Sept. 13, 2015 at 06:43 p.m.
Ravens quarterback Joe Flacco's pass to wide receiver Steve Smith Sr. is intercepted by Broncos cornerback Aqib Talib, who takes it in for a touchdown! Published: Sept. 5, 2013 at 10:39 p.m.
Baltimore Ravens quarterback Joe Flacco's pass is intercepted by Denver Broncos cornerback Chris Harris at the Ravens' 24-yard line. Published: Jan. 13, 2013 at 04:28 a.m.
(3:16) (Shotgun) J.Flacco pass incomplete short middle to D.Pitta (M.Adams).